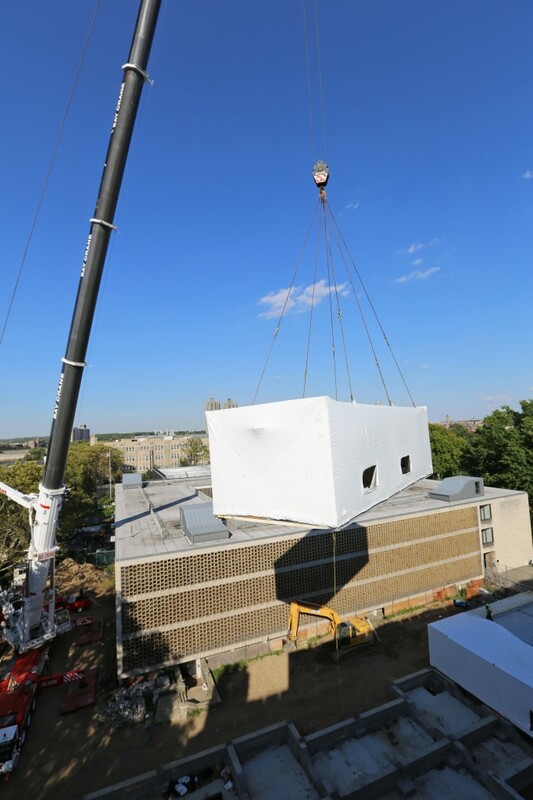 For the second day in a row, Lehman College was a busy construction site on September 26 as twenty-two prefabricated modules—each weighing 18 tons—were hoisted into place over Goulden Avenue with a 600-ton crane. All of this heavy lifting, performed by workers with the Long Island-based Axis Construction firm, was part of the process to create the College’s new two-story Child Care Center, the latest building to grace the 37-acre campus. “We have long needed a larger facility to meet the child care needs of our students,” said Vice President of Student Affairs José Magdaleno. “This beautiful new building will support student success at the College by providing affordable child care to students who need this assistance to pursue their educational goals.” Lehman was one of the first CUNY colleges to open a child care center, back in 1971, which then moved into a larger facility in 1985 that is now being replaced by this new building. The new center, designed by Brooklyn-based Garrison Architects, is situated between Davis Hall (to the south) and Shuster Hall (to the north). The $6.3 million structure—built with funding from New York State capital funds—will include 12,000 sq. ft. of space. When it opens in January 2013, it will be able to accommodate 140 children enrolled in its various all-day and after-school programs, double the capacity of the present center. The steel-and-concrete modules were built in an enclosed facility in Ephrata, Pa., which kept them largely immune to the weather and normal production delays associated with the traditional construction process. Lehman estimates that, as a result, the interval from groundbreaking to occupancy will be reduced by approximately half the time, providing a significant savings in time and construction costs. Containing not only walls but also windows, flooring, lighting, plumbing fixtures and other major elements, the modules were 99 percent complete when they were trucked to the Bronx. Once all are lifted onto the site’s concrete foundation—a three-day process that concluded on September 27— the contractor will make final connections between modules and to utilities, finish site work, install final interior finishes and paint unfinished walls. 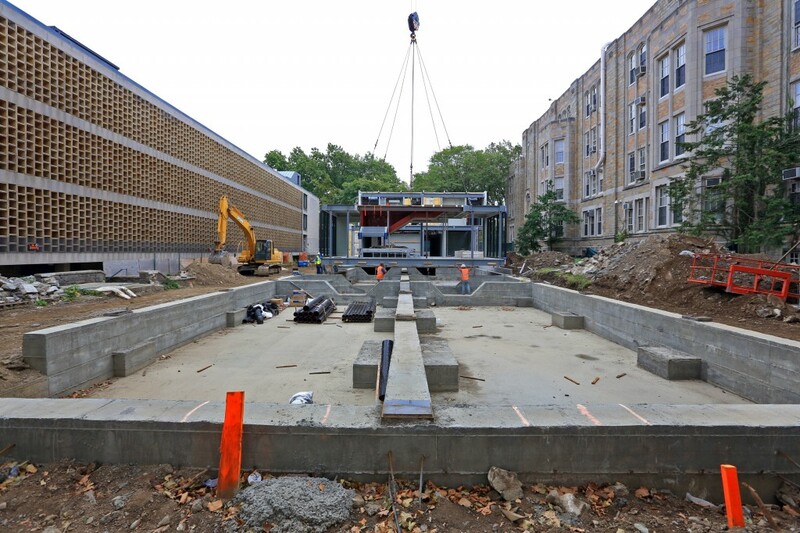 The center features six classrooms; a multipurpose room that can function as a playroom, after-school space or additional classroom; and a natural playground incorporating greenery, boulders and garden space, along with traditional playground equipment. A lobby atrium will provide an open stairway to the second floor and skylights that offer a natural ventilation system, as air heated by incoming sunlight is exhausted through the atrium ceiling. Lush, green vertical gardens, visible from the classrooms, will line the east and west facades of the structure and offer both shade and greenery during summer months, while large glass sliding doors bring in daylight for classroom spaces. Materials throughout the center have been chosen for durability and recycled content, continuing a College and CUNY commitment to sustainability. The center will be wheelchair-accessible, with a path of travel from Goulden Avenue to Davis Hall constructed in compliance with the Americans with Disabilities Act and enabling easy access to Davis Hall, the Child Care Center and the rest of the campus.